This story is by a friend of mine whom I’ve recently entered a reading circle with. Although I had downloaded the book awhile ago, the circle bumped me into action to finally read it. Daniel I. Russell gets creative with his bloody horror and doesn’t mind pushing the limits to make you go ‘Wow!’ or ‘Eww!’. He knows how to truly entertain someone who doesn’t mind exploring that twisted place they have inside themselves. 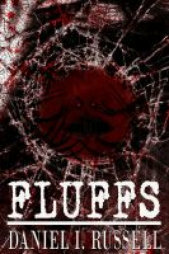 Fluffs starts out in the life of a young man who likes to do drugs. Shaun’s sitting there, high, minding his own business, when something strange happens. He doesn’t realize at the time that what’s happening is real, I mean, come on, he’s high! But later he finds out the strange occurrences really did happen. The characterization in this story is great; you can see the characters as real people. The action keeps the story moving and words aren’t squandered on nonsense. I have to give this story 2 QUILL. This entry was posted in 2 Quill, Adult Horror and tagged 2Q, Daniel I. Russell, Fluffs, horror. Bookmark the permalink.